Bran Enriched Wheat Flakes with Sultanas. High in wheat bran fibre. That fuels a healthy gut. Helping you feel at your best every day. Suitable for vegetarians. Halal - HFA approved. Kosher. High in wheat bran fibre* Healthy gut* 4.4g wheat bran fibre per serving* *10g wheat bran fibre daily contributes to acceleration of intestinal transit. 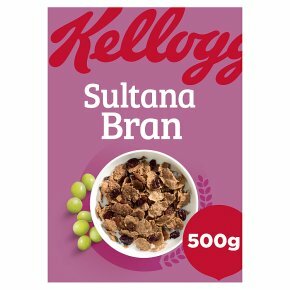 Sultana Bran contains 4.4g per serving.